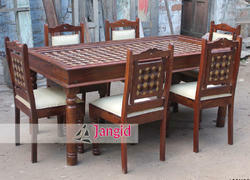 This is Handmade Wooden Dining Table set made from Mango and Sheesham Wood. This dining set if hand carved and brass fitted to give it antique look. Jangid art and crafts is a manufacturer and exporter of All type of Carving Furniture such as Dining Room Furniture, Living Room Furniture, Bedroom Furniture and Kitchen Furniture. 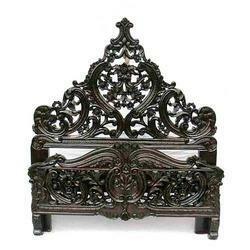 King size walnut wooden Bed Handmade and handcarved with "shawl penzillee design"